‘Tis the season for gift guides! If you find yourself in my position this year — preparing for a baby while simultaneously decking the house and getting ready for holiday guests — you haven’t yet finished your Christmas shopping. Thank goodness for Amazon Prime! I love looking to other mommas for gift ideas, and I hope you will find our guide just as helpful. (1) Lego Duplo Creative Cars: We already have the construction site and farm sets, which we love. (2) Steam Train, Dream Train: I assume this will be as big of a hit as Goodnight, Construction Site. (3) Melissa and Doug Shopping Cart: We’re adding to Sam’s kitchen corner this year, since he currently loves to “cook” for us. I just hope I don’t regret getting this cart that he will likely try to race around the living room. (4) Brio Boxcar Train: Also adding trains and accessories to his hand-me-down Brio train table. 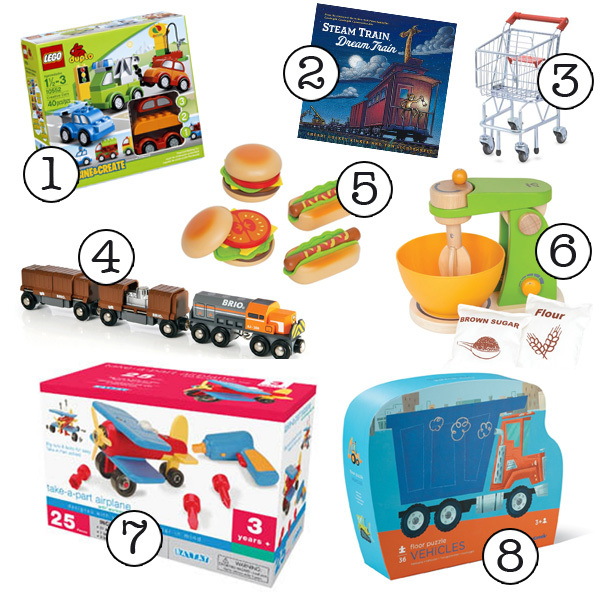 (5) Hape Hamburgers and Hot Dogs: More food items for pretend play. (7) Battat Take Apart Plane: Comes with a power drill! Sam will go nuts over this. (8) Crocodile Creek Vehicles Floor Puzzle: Ready for some more difficult puzzles. And this one comes highly recommended by Oh! Apostrophe. Next up: Tried and true favorites in our house. (1) Green Toys Recycling Truck: Sam loves to fill this with matchbox cars and drive it around the house. The other vehicles in the series: the Dump Truck and the Fire Truck are just as much fun. (2) Do a Dot Markers: We’re currently really into arts and crafts, and these paint markers are great for practicing the lines of letters and numbers. (3) Melissa and Doug Puzzles: You really can’t go wrong with Melissa and Doug puzzles, in my opinion. We have a few stacks, but this set is a favorite. (4) Melissa and Doug Corner Kitchen: Santa brought this for Sam last year, and he plays with it even more now than he did then. Can’t wait to add to his kitchen collection this year! (5) Play-Doh Barnyard Pals: Nini brought this for Sam during her recent visit, and he is obsessed. It will keep him occupied for a good 30 minutes at a time. (7) B. Dr. Doctor: Another great find from the B. series. Sam especially likes to check the baby’s heart in momma’s belly. (8) Melissa and Doug Reusable Sticker Pads: There’s a big variety of these available, just make sure to get the “reusable” version. It’s a favorite! 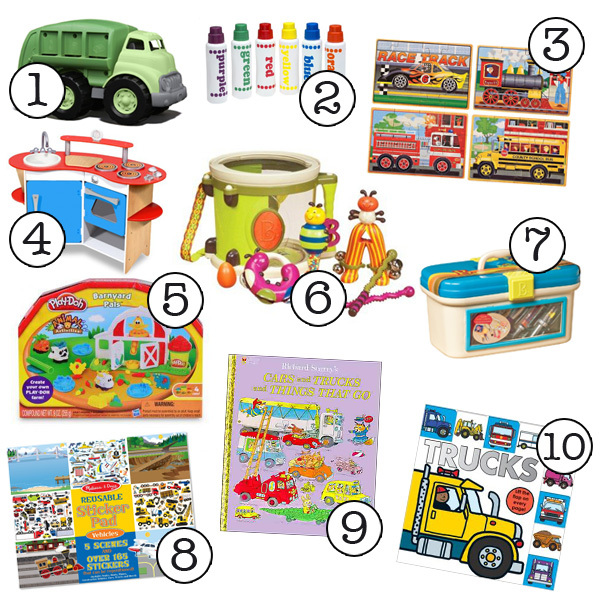 (10) Lift-the-Tab: Trucks: This was a birthday gift from Sam’s little buddy, and it became a fast favorite. Sam has even memorized the names of the drivers of all the trucks! Links are to Amazon Affiliate, but everything here was purchased or will be purchased by us. We thought about getting Andrew a kitchen, but we don’t have the space for it, so we got him an outdoor toy instead that I’m sure he’ll love since he gawked at one the last time we went camping. haha!